School lunch: Is $1.50 a child enough? Matt Antignolo has worked in public school cafeterias for 24 years. He's learned two key truths: Just about every kid loves pizza, and an alarming number of American youngsters still can't afford a $2.35 lunch, despite the dramatic expansion of free and reduced lunch programs. When a student doesn't have enough money for lunch, cafeteria staff in many districts, including Antignolo's, take away the child's tray of hot food and hand the student a brown paper bag containing a cold cheese sandwich and a small milk. Some schools take away their lunch entirely. "It's the worst part of the job. Nobody likes it," says Antignolo, who's now director of food services at the Lamar Consolidated District outside Houston. All the other kids in the lunch line know what's going on. Getting that brown bag is the lunch line equivalent of being branded with a Scarlet Letter. 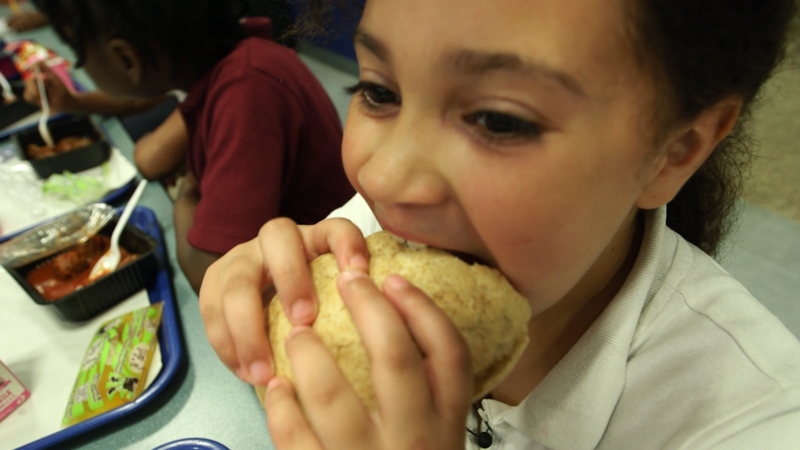 It's been dubbed "school lunch shaming." It happens across the country: 76% of America's school districts have kids with school lunch debt, according to the School Nutrition Association. The horror stories keep coming. In 2015, a Colorado cafeteria worker says she was fired for personally paying for a first grader's meal. Last year, a Pennsylvania lunch lady quit in protest after being forced to take food away from a student who was $25 in debt. Policies vary, but many schools serve an "alternate meal," like a cheese sandwich, once a student's debt hits $15. Last month, New Mexico banned any form of lunch shaming. The dramatic move highlighted this hidden crisis in schools and ignited a national conversation about what to do when students can't pay. The federal Department of Agriculture, which oversees school meals, is requiring that districts at least have a written policy in place by July 1. "It's very obvious who the poor kids are in the school," says New Mexico state senator Michael Padilla, who drafted the bill to stop lunch shaming. He told NPR that he mopped the cafeteria floors in order to afford lunch as a kid. 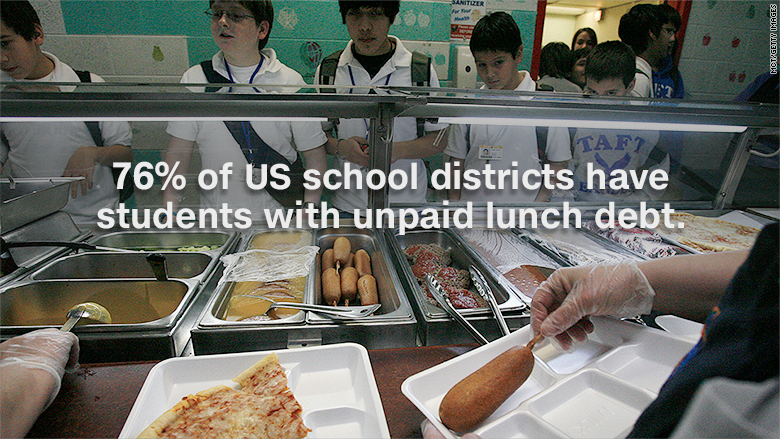 The USDA is urging districts to stop "embarrassing" and "singling out" students who don't have enough money for lunch. On Monday, US Senator Tom Udall of New Mexico introduced a bill in Congress, the Anti-Lunch Shaming Act, to ban schools from singling children out "by requiring them to wear wristbands or hand stamps or do extra chores" if they have unpaid lunch bills. Chris Robinson hopes Texas passes a similar bill to New Mexico's. Growing up in a mostly black school, Robinson was ridiculed for not having lunch money. There was a separate line for pizza at his school. He could never afford to stand in it. Now 33, Robinson is a special education teacher in Houston. In his first year teaching a few years back, he watched a young boy go around the cafeteria collecting food scraps before the lunch period ended. He said it took all his inner strength not to cry. 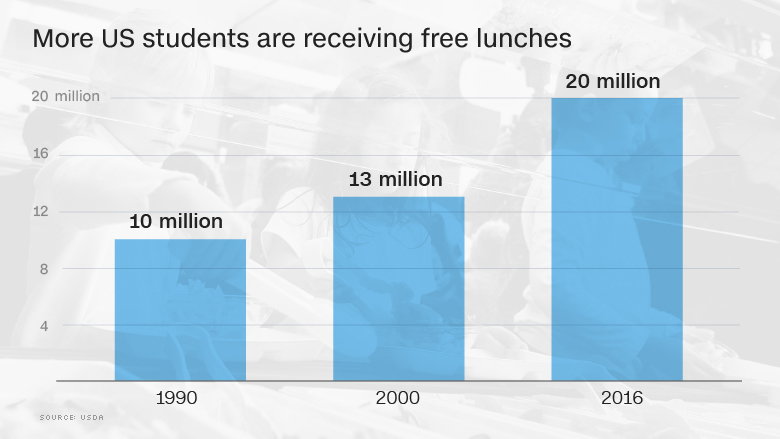 Currently, 20 million young people -- about 40% of all US students -- receive free lunches, up significantly from 13 million in 2000. Robinson can see first-hand that kids are still unable to pay for food. "I just felt I had to do something. I can't save everyone, but if I could do something about these cheese sandwiches, it would be worth it," says Robinson. 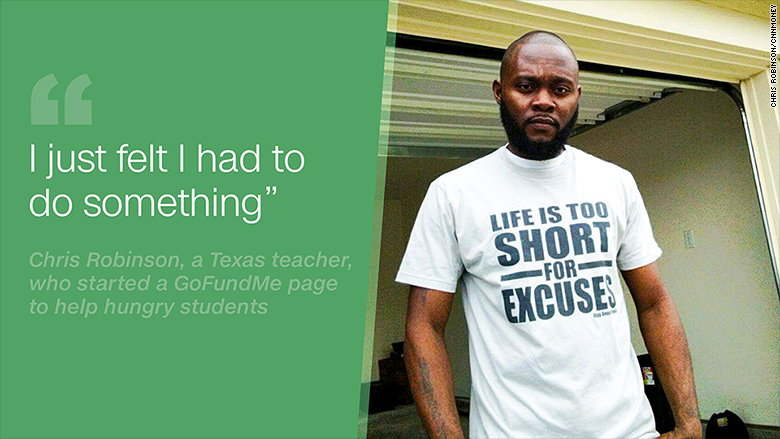 He posted a video on GoFundMe, a fundraising website, asking for donations to pay off student lunch debt. He and his wife also pitched in. The campaign raised about $700. He took it to the Fort Bend District in Sugar Land, Texas. A few days later, he received a letter in the mail from an elementary school student. It was elaborately decorated with crayon drawings of butterflies and flowers. 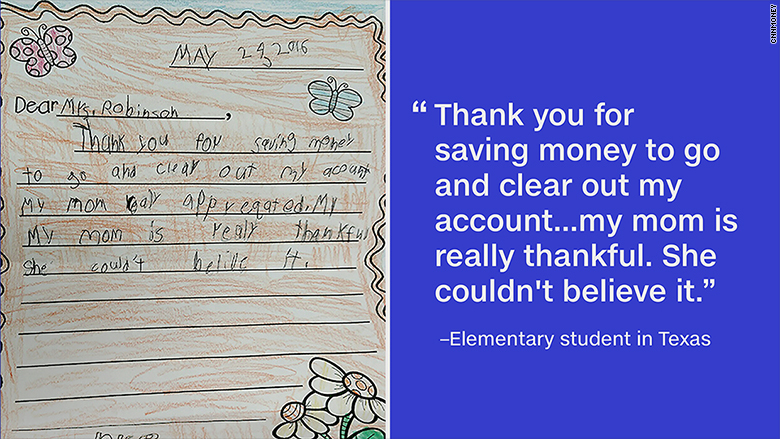 The note read: "Thank you for giving money to go and clear my account. My mom really appreciated [it]. My mom is really thankful. She couldn't believe it." There are 30 GoFundMe campaigns to raise money specifically to pay off school lunch debts so students can get hot meals. One is from Amina Ishaq, the PTO president of an elementary school in Antignolo's district. She's raised about $2,100 so far. Like Robinson and Padilla, Ishaq grew up in a low-income household. Her parents divorced, and the family often lived paycheck to paycheck. She was one of those kids who was "right above that cutoff line" for free lunch. Schools resort to cheese-sandwich shaming to get lunch debts paid off because they have to fork over the money at the end of the year to cover whatever debt parents don't pay. The amounts add up quickly. When Antignolo arrived at the Lamar district in 2013, there was over $180,000 in unpaid school lunch debt that year. It could have funded two or three teachers. The School Nutrition Association reports some districts have debts as high as $4.7 million a year. "Some families have the money and just don't pay," Antignolo laments. But he knows others are legitimately struggling because the school often gets a large influx of payments every other Friday -- a common payday. Antignolo helped institute a program to aggressively call and send letters home encouraging parents to apply for free and reduced lunches. He realized many families likely qualified but didn't know it. His efforts appear to be working: School lunch debt has fallen to about $61,000 this year. But there are still over 4,000 students carrying debt. "The kids we're most concerned about are kids on reduced-price school meals who are struggling to come up with the co-pay of 40 cents at lunch," says Crystal FitzSimons, a director at the Food Research and Action Center. A family of four earning under $31,400 can get free lunch for the kids. The reduced lunch cutoff is about $45,000 for a family of four. Families have to reapply every year for the aid. That's where a lot of the issues come in, say experts. Antignolo sees a bunch of debt pile up in early October, the expiration for the grace period to enroll again. It's slowly getting better, as districts use technology to aggressively call, text and email parents when their kids' accounts get low, let alone overdrawn. Families also qualify automatically for free lunches if they are on food stamps or a child is in foster care. But the fact that some districts are racking up $4.7 million in unpaid school lunch debt signals that something is still very wrong. "It's the working poor who get screwed," says Jill Duban, who heads up a program called Common Threads in the Lamar district that helps low-income and homeless families. "The lunch ladies are not always nice about it." A homeless student was recently in tears in Duban's office because she had a $100 balance from a time before her family lost their home. She feared she wouldn't be allowed to walk at graduation. Thankfully, some of the money Ishaq raised in her GoFundMe campaign went to pay off the young woman's debt. The Trump administration has proposed a massive cut of 21% to the USDA's budget, but it's unlikely school lunch funding will be impacted since it's considered an entitlement program. Still, it's a sign there likely won't be more money for these programs. People on the front lines tell CNNMoney that the Community Eligibility Program has become a lifesaver. Enacted in 2010, CEP gives free lunches to every student in a school where at least 40% of the families are extremely poor and automatically qualify for government aid. "It gets rid of the school meal application process and saves a lot of paperwork for the schools," says FitzSimons. In the Lamar district where Duban and Antignolo work, 10 elementary schools qualify for CEP out of 40 total. They wish more of their schools could be part of it. "We provide all students with a free bus ride and free textbooks. Why not provide them with a free meal while they're in our care during the day?" Antignolo asks.